As you may be aware, our December release included a number of great feature enhancements and updates. If you missed our announcement, check out our latest blog post "Exciting New Changes at Bundledocs". One of the most significant changes made was the removal of the Storage Area. No need to worry, all the same features you use are still here. So how will these updates change the way you work? The removal of the Storage Area means it is no longer necessary to move documents from the Storage Area to the Work Area when building your bundle. You can now upload your case documents directly into the relevant section. This will help save even more time! 2. Within the 'Choose an upload location' section, select the dropdown. This will reveal any sections created within your bundle. Choose a section where you wish to upload your documents, for example, Pleadings. 3. Select the 'Choose documents to upload' button and select the case documents you want to upload. Your files will immediately begin to upload and will automatically appear within the relevant section of your bundle. At Bundledocs, we have been busy enhancing our product to ensure we continue to deliver the best service offering to you. Over the last few months, we have been conducting research into how people use Bundledocs and based on this valuable feedback we have made a few key changes. 1. DESIGN: One of the most significant changes made in this release is the removal of the Storage Area. Don't worry all the same features you use are still here. 2. UPLOAD: Our new design means no more dragging and dropping from the Storage Area to the Work Area. Now you will upload directly into the relevant sections of your bundle. 3. MERGE DOCUMENTS: The merge function has been re-introduced in our latest release enabling you to easily merge multiple documents into a single file. 4. TITLE PAGE: From our research we have found that users often have difficulty finding the 'Upload Bundle Title Page' feature. As such, this is now contained within the Generate options. 5. PREVIEW COMPLETED BUNDLE: Now once you generate your bundle a preview window will automatically appear. From this you can easily review your bundle, download or even print. Our new release is scheduled for Monday December 1st 2014. If you have any queries or questions regarding our latest updates, please get in contact with our team today! At Bundledocs, we are continually developing to help ensure we deliver the best service offering to you. Most recently, we have added a Preview Bundle Window so you can quickly and easily view your completed bundle. What is the new Preview Bundle feature? Our new preview bundle window will automatically appear once you have generated your bundle. 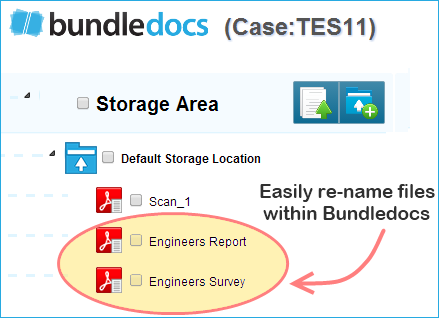 This is great as it enables you to immediately view your completed bundle within your Bundledocs account. The preview window enables you to scroll, download or even print your bundle. With the addition of this new feature, will I still be able to download my bundle as normal? Yes. For those that wish to download your bundle this can be done either within the preview window or by selecting the Download button (as normal). Furthermore, as Bundledocs automatically emails your completed bundle to you, it can also be downloaded within your email account. For those that use Bundledocs regularly you may be aware that once you generate your bundle the completed PDF bundle is automatically emailed directly to you. This is great as it enables you to view your completed bundle from any device, at any time, regardless of whether you are in the office or now. Select your email in the top right corner of your account. From the dropdown select 'My Account'. Within the 'Account Information' tab, select the '+' beside the 'Options' section. If you do not wish to receive these emails, then select the box next to the 'Receive Bundle Generated Email'. This will ensure that you do not receive these automatic emails. Remember, you can change back at any time. Simply re-select the 'Receive Bundle Generated Emails' to begin receiving these emails again. At Bundledocs, we are firmly focused on helping our users create professional bundles with ease. In order to help make the process of creating bundles easier, we are continually developing and expanding our standard service offering. In this Feature Focus post, we will highlight one very useful feature within Bundledocs - Split Range. What is the Split Range Feature? In short, our Split Range is designed to help users easily 'Split' or divide any uploaded file into smaller sections. You decide how it is split - the number of sections and how many pages should be contained within each section. It is particularly useful for anyone working with large files or scanned documents. With Bundledocs we can upload any file type. For this example, we have uploaded a scanned PDF which we would like divided into two separate files. With Bundledocs, you can quickly and easily split any uploaded file. Remember, you choose how the file is divided. The new 'split' files become immediately available. That's it. To complete, we will re-name our new split files by simply double clicking the file name. If you would like any more information, get in touch with the Bundledocs Team Today!